The Software Build Requirements is a worksheet used to keep track of information for a complex software build process. has helped our company produce professional looking contracts which in turn has increased our customer base. Once we have entered our clients details it is so easy to produce pre contract agreements and all the other documents/contracts that our company needs." This Software Build Requirements is included in editable Word format that can be customized in Word or by using the included Wizard software. Software Build Requirements Documentation Current Date. Hardware or Peripheral Devices Required for Execution Insert Description Here Minimum Number of Machines for Testing (include OS requirements). Third-party Software Required for Operation. Database(s) Required for Operational Testing. If so, does the build contain the necessary SQL or scripts to create the database(s). Total Estimated Time to Install and Configure all Required Software, Tools. Total Estimated Time to Conduct Limited Testing. Test Plans Included in Deposit. Connections to third-party systems, web service or other resource required. Software Build Requirements: Audit Procedures. Note: Upon the delivery of any of the build deposits to Beneficiary by Depositor, the following procedures shall be conducted prior to the acceptance of each deposit. Depositor shall provide to Beneficiary or Beneficiary's Agent(s) any additional access required, including access to all source and build instructions in order to create, test or otherwise execute the build of the following fully functional software application(s). Audit Material(s) Procedure. 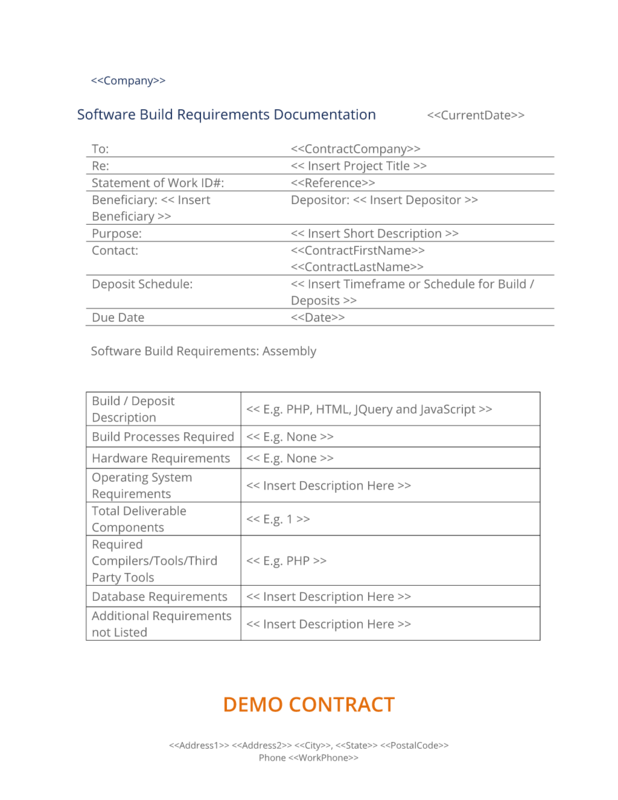 The complete Software Build Requirements - with the actual formatting and layout - is available in this Contract Pack.